Krishna. In the Vedic literature there is a nice story about Dhruva. This Dhruva understood from his mother when he was only five, that God can be found in the forest. Dhruva went to the forest in search of God. The Lord Narayana in heaven or in the heart of Dhruva understood the sincerity of Dhruva's purpose & sent Narada, His great disciple to initiate Dhruva in the matter of Krishna Consciousness. This incident confirms that by the grace of Krishna, Dhruva was able to get the help of Narada as his spiritual master. 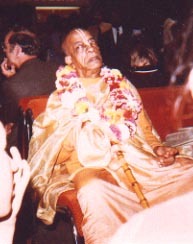 Therefore, Krishna Consciousness is a parallel process in worshipping the Supreme Personality of Godhead & the Spiritual master simultaneously. Your desire to become the servant of the servant of Krishna is very pious. Lord Chaitanya desired the same thing in order to set an example, though he was Krishna Himself. The Bhagavad Gita confirms this. I am so pleased to learn that you are all living in the Brahmacary house with Jayananda & Upendra & I am more pleased that you are all working. Everyone can achieve the highest perfection of life by working in his specific capacity. Hope you are well.